For the second Friday night in 3 weeks, I would be doing a groundhop in Wales, indeed I had been to football more often than not on Friday evenings this season. Last week it was the Eastern League Groundhop, and I would be hoping for better luck this week with the match bring called off right on kick off due to fog. It was going to be an expensive one again, as Anwar yet again was unavailable, this time due to his Mum working and being unavailable due to look after his kids. Frustrating, but unavoidable, as you have to put family first. I did briefly consider staying in for the night, but last time I spent a Friday in, I was bored, and it was either stay in and have a few drinks, or go out to football. I decided to take the latter and slightly healthier option, though I would still get to sample some Welsh Cider, which as I have said before on here, is my favourite. I had been steered towards Taffs Well by my friend and fellow groundhopper Matt Harrison. 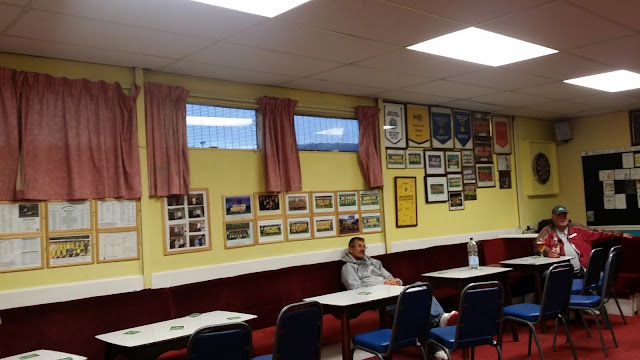 His excellent Lost Boyos blog had provided me with the inspiration to go to Cefn Druids a fortnight previously, and I had enjoyed my visit there. The other option closer to home was Eastbourne United v Colliers Wood United in the FA Youth Cup, but I wasn't sure about going to see a youth game. Plus there was 2 teams near Swansea - Garden Village and Briton Ferry. These had the added bonus of possibly seeing top Swansea mate Nathan, but it was a bit further, plus the fact that I fancied seeing him play football for his Saturday morning and making a weekend of it. The thing that swang it in the end was the reputable Fagins Ale and Chop house which would provide me with dinner as long as they didn't take the mickey with food prices. I also wanted to go to a retro games shop in Cardiff called Super Tomato, but after looking at the stupidly expensive parking in Cardiff (£5 an hour) I decided to go to Taffs Well, park up, and see what time it was. If I wanted to go into Cardiff, it was a 15 minute train journey away, and the fare was the same as an hours parking in the city. It would also give the early opportunity to check out the pitch, given that there was light rain scheduled for the morning in South Wales. Unlikely to be a problem, but I didn't want to take any chances, given that I would be driving a long way. I would also be checking the state of play on Twitter before I left as well, just to make sure there wasn't any early call offs. The village of Taffs Well is situated 6 miles north of Cardiff, and gets it's name from the River Taff. 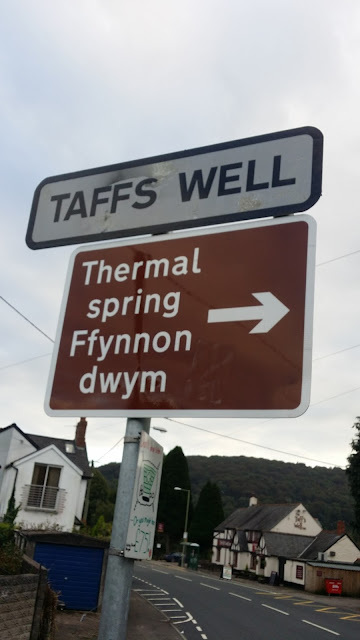 It is also the place of the only hot thermal spring in Wales, that has been in use since Roman times and reaches 66 degrees Farenheit. It had a population of just over 3600 according to the last census, and has it's own train station, with a 20 minute journey getting you to central Cardiff. TAFFS WELL AFC were founded shortly after World War 2, in the summer of 1946. They played in very local leagues until 1977 when they joined the Welsh Football League Division 2 (level 3 of the Welsh Football pyramid) They earned promotion in their first season, getting up to Division 1. Their best period came in the 1980's when they had a couple of spells in the Welsh Premier League. They had best ever finishes of 4th, 2 seasons in a row in 1986 and 1987. However, they were relegated the following season and have not been back since, even spending seasons in Division 2 after being relegated again. They've been in Division 1 since 2004, and last season had their best ever finish since returning, finishing in 2nd place behind Monmouth Town. This season they were way down the table in 13th place.AFC PORTH were doing even worse, bottom of the league and one of 2 teams to lose all games so far. The club have been around in various incarnations since 1902. The current outfit joined the Welsh League Division 2 in 1991, winning promotion to Division 2 (sounds strange, but the league had a reorganisation) Fed up with being in the same division name wise after promotion, they repeated the trick the following season, and were up in Division 1. They changed their name to AFC Rhondda in 1996, performing well at first but following a turbulent time at the turn of the millennium, which saw them relegated twice, they reverted back to their original name in 2004. This saw them bounce back up to Division 1, but their best ever finish remains 3rd in Division 1 in 1999. Last season they finished just below halfway, in 10th place out of 16. On the day I left work at 12.30 after a fairly easy day for a Friday. I went and got changed, then as I was hungry went and got a cheeseburger and chips from McDonald's. I'm not usually a fan, but on this occasion, it cost little over £2 and though the cheeseburger still had the added nonsense like gherkins, it was passable and the fries were actually very decent. I eat them on the way up to my car and had the rest when I got there, also having some of my diet irn Bru. I left at 12.45 and the journey started well enough. That was until I hit Oxford and an accident on another road bought all the traffic in the area to a standstill. I had about 20 minutes added to my trip, then the same again for a variety of delays, meaning I lost 40 minutes in all. When I got to the ground, it was just before 4.30 and I was all for going to the village train station and getting a train into Cardiff to a retro games shop I wanted to visit. I started making my way there, though halfway through, I realised it would be very tight, and so turned back and went back to my car. I decided to get some pictures of this ground while it was still light. While I was there I spoke to the groundsman. He showed me a programme in the clubhouse of from when Wycombe played Taffs Well and also gave me some old programmes from the past 2 seasons of some of Taffs Well's away games so I could learn more about the league. I also saw his dog, who was very friendly and liked the attention. From there I headed to Fagins, the pub that had been recommended to me by Lost Boyo Matt Harrison. It was still only 5pm and I knew I had to be careful as I was driving in 5 hours. The Internet on my phone was dead slow, so I tried to use my wireless dongle. The signal was fine, but sadly the battery wasn't and it only lasted a minute before conking out. So instead I stared typing my blog. The place seemed to be a haven for dogs, I had seen 4 dog walkers on the way in, the groundsman had a dog and now there was a border terrier in the pub. I'd already ordered my favourite cider, Happy Daze and vowed to have a second pint before going for a walk down the village in search of food. The pub did nice looking nosh, but I had time to kill, and so wanted to explore further. A routine and one sided win for Taffs Well who were on a 5 game losing run. But AFC Porth had lost all 7 of their games. The goals were fairly unremarkable and I think the visitors only had 1 shot. Most amusing aspect of the night was the linesman looking like Alan Carr. Credit to the hosts, they got the ball down and passed it and must have had 80% possession. I had a £15 voucher to spent at Tesco, which they gave to me after the unavailability of 2 products that I normally buy when I go to Wales. That was as a result of a visit to the store in Wrexham which occurred when I went to Cefn Druids a fortnight ago. I got the Welsh cider that I wanted and also as I was hungry got some crisps and some Irn Bru. They were also selling off the stuff in their hot cabinet so I got 2 jumbo hot and spicy sausages for 40p. By then it was just after 10pm and apart from a brief stop at Reading services to go to toilet it was a smooth journey home. I got in at 12.15 and after checking Facebook I watched TV in bed before going to sleep. It had been another good night in Wales amongst good people, and will only encourage me to try and do more in this league. Though the way my expenditure is going, I will be hopeful of some company next time. Some unlucky hoppers who were at Felixstowe, only to see the referee abandon it due to fog (wrongly in most peoples opinion) also missed out at the game at Connah’s Quay. The game was abandoned after 10 minutes due to floodlight failure. In the same league Garden Village beat Cambrian and Clydach 1-0, while Briton Ferry triumphed 2-1 over Goytre United. Wycombe Wanderers v Cambridge United the following day. RHIW D’DAR is a smart ground in pleasant surroundings. There is a stand on each side of the pitch. To the left is the older original stand which offers a combination of seating and standing. On the other side is a newer stand, this is interesting in that it has the dugouts built in underneath. I’d hazard a guess that there were around 300 seats and 150 covered. The rest of the ground is open, but this would be fine for the Welsh Premier League, no matter what ground graders say. Elsewhere, the club has badges, ties and tracksuits for sale. The bar has lots of club stuff on the walls and offers the usual range of drinks. The tea bar didn’t do food when I went, so eating outside is a good option. The are seems to be monopolised by the Chinese, as from what I saw both takeaways were Chinese chippies. The pub, Fagins, also does food at reasonable prices, plus best of all a great range of drinks.